The Digital Foundry at Eurogamer has the story. 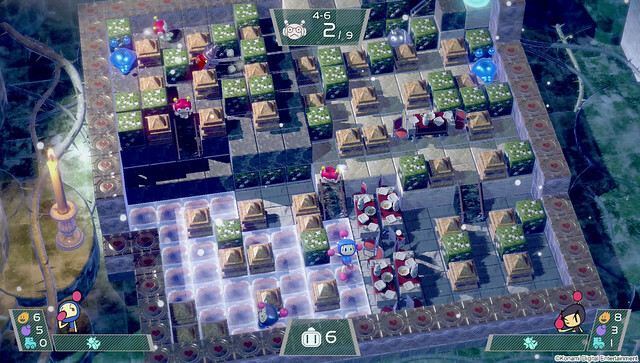 By default, Bomberman R's launch code operated at a full 1080p at 30fps in docked mode while dropping to 720p at 30fps when in portable mode. We updated our copy to version 1.3, jumped into a battle and quickly discovered that the game has indeed been updated to run at 60 frames per second. Between the more responsive controls and faster frame-rate, it simply feels better to play. So how did the team manage to push a 30fps Unity game up to 60fps on the Switch? Simple - the compromise shifted from frame-rate to resolution. When docked, Super Bomberman R drops from a native 1080p in its original form to 720p with the new patch in place. That's a large drop in clarity, but in our opinion, the smoother gameplay more than makes up for it. The compromises continue in portable mode, where the older code's native 720p dips down to 960x540 instead. The loss in clarity is certainly evident but again, the extra fluidity pays dividends here. This isn't the full story, however. When playing the game's story mode, the original 1080p output is retained but the frame-rate cap is removed. As a result, the story mode now runs with a less stable, but overall higher level of performance, averaging around 45fps now. It's not optimal but without discussing the game with its developers, it's impossible to know if the more detailed story mode could hit 60fps at 720p. When Bomberman taxes a system so hard it can't run in 1080 at 60fps, you know you have state of the art hardware and premium developers. Such cutting edge! Only 400 dollars! Terrible. Hardware that's struggling at launch, lol. Terrible. Would you part with thirty pieces of silver for one? Check your sofa. We'll wait! Framerate is a balancing act between visual fidelity, resolution and the secret sauce of optimization. It would be very simple to make a version of Bomberman that could bring a 1080 Ti to its knees at 1920x1080. THIS version of Bomberman, however, shouldn't tax any console of the past two generations. It looks like an above average cell phone game and yes, this speaks volumes about the Switch and potentially its long term ability to provide developers the needed resources to port their games. Interesting scenario, if the Switch were to win and push MS and Sony to the wayside or have them develop similarly weak hardware in the future, it would be a boon for PC gaming as the last place to sell AAA-visual titles. THIS version of Bomberman, however, shouldn't tax any console of the past two generations. It looks like an above average cell phone game and yes, this speaks volumes about the Switch and potentially its long term ability to provide developers the needed resources to port their games. Well, it is published (and probably developed) by Konami - mobile developers at heart. BTW, what happened to Hudson? Absorbed by Konami in 2012 or so. Hahahahahaha! Stop it, stop it....I know you're just hypothesizing, but...hahahahaha, STOP IT! Nope. Not really worth considering. Impossibru.